Was your ancestor born in Reusel-De Mierden, Noord-Brabant? Guess again! When I look at online trees, especially on Ancestry.com, I often see “Reusel, Reusel-de Mierden, Noord-Brabant, Netherlands” listed as the place of birth. At first I was puzzled how all these people with names that are typical for Friesland, Groningen or Gelderland would have children in a village on the other side of the country. There was obviously something wrong there. But then I started using FamilyTreeMaker and tried to resolve some place names. Guess what? “Holland” resolves to “Reusel, Reusel-de Mierden, Noord-Brabant, Netherlands.” Say what? “Holland” is listed as the place of birth in many US sources, such as census records or marriage records. Usually, it refers to the country the Netherlands, which is officially called The Netherlands but often mistakenly called Holland. When you record “Holland” as the place of birth, and then try to automatically resolve that to a geographical name that is located on the map, the program starts to look for a geographical location named Holland. Earlier versions of FamilyTreeMaker didn’t find the country, but it found a street called ‘t Holland (or the woodland) in the village of Reusel in Noord-Brabant. It then changed the place name ‘Holland’ to ‘Reusel, Reusel-De Mierden, Noord-Brabant, Netherlands’. 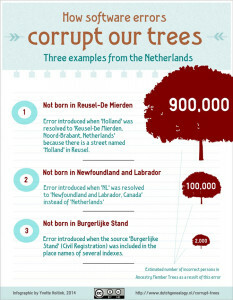 The good news is that this problem has been fixed, “Netherlands” is now the first suggestion that comes up when you try to resolve “Holland.” But there are thousands of people in online trees that still have “Reusel, Reusel-de Mierden, Noord-Brabant, Netherlands” instead of Holland as their place of birth. Since many genealogists just copy information from online trees without going back to the underlying sources, this mistake has found its way to trees at Ancestry.com, Familysearch, MyHeritage and several paper publications. I predict that this mythical place name will continue to confuse researchers for generations to come. Since knowing the place of origin is vital in tracing your immigrant ancestor, I’m sure this mistake has caused many brick walls. What are the chances your ancestor really is from Reusel? Reusel is a very small village in Noord-Brabant, with a population of less than 1,000 in 1849.1 Not many people emigrated from the area so the chances that your (immigrant) ancestor is actually from Reusel are very VERY small. The municipality of Reusel-De Mierden, however, has only existed since 1997, so did not exist during the time your ancestors alledgedly lived there. If you want to make sure, just check your sources and see where the information came from. If it came from an online tree or another undocumented publication, I would be very suspicious. But if you found the place name “Reusel” in an original record, it could be legit, especially if other family members were also from Noord-Brabant. But you won’t find “Reusel-De Mierden” in original records prior to 1997. Reusel in 1867. Image credits: Wikimedia Commons. If you’ve ever used online trees to find information about your ancestors, I advise you to check your own tree for people born in Reusel. If you have any, I would really appreciate it if you would leave a comment and share your thoughts. Let’s all work together to debunk this myth! I created an infographic to show the extent of this error. I have traced my Dutch ancestry back to Wynant Gerritse Van Der Poel born 1617 in Reusel-de-Mierden. He married Tryntije Melgerts Rocholte from Sloterdijk Amsterdam in 1640. They then left for New York where they died. , Does it sound correct? After reading this I am in doubt. How can I find out. I will travel to the Netherlands this year and would hope to pursue this to see if any Van der Poel’s still live in the area. This is definitely one of the errors. Where did you find this information? Only by going back to the sources will you be able to tell the truth. I did a quick search on the Amsterdam city archives website and found a marriage record of Wijnant Gerritss [no last name] to Trijntie Roocholt, married Sloterdijk 21 October 1640 that shows he was from Meppel. Meppel is in the province of Drenthe, on the other side of the country from Reusel-De Mierden. I also saw that several of their children were baptized in Amsterdam. Whether this is the same couple as the couple that went to New York would require more research. Thank you for posting this information. I was told that some of my ancestors came from Reusel de Meirden, but upon further researching I can not find anything that fits. I have traced a Samuel Sebrell and his son Frederick Sebrell and I believe they came from the Netherlands in the 1750s, but I don’t know how true it is now. Do you know where I can find any records of Sebrells in the Netherlands. I spotted another site mentioning an ancestor from Reusel-De Mierden. It is http://www.sandinmyshoescapecod.blogspot.nl/p/immigrants-map.html. I informed the blog owner and mentioned this blog post. Just hope she is not too disappointed. Thanks for sharing! I don’t think we will ever get rid of these errors but every little bit counts! Thank you! I thought it looked odd, having Holland listed first, and I always like to look up where people are from. My search came straight to this article, and I am so grateful! And yes, the big online tree has it all over. This is incredibly helpful and insightful. Thank you! I too am suspicious, thanks to your info. The family tree app of Family Search shows ancestors in my line: Richard Sears or Sayers born 1508 in Colchester, Essex, England with his death in 1540 in Holland, Ruesel de-Mierden, Noord-Brabant Netherlands. It shows his wife Anne Knyvett born 1509 in Ashwellthorpe, Norfolk, England died 12 Nov 1595 in Holland, Ruesel de-Mierden, Noord Brabant, Netherlands. It also shows their son John Bouchier Sears or Sayers (1528-1561 born and died in Amsterdam Noord Holland Netherlands) married to Elizabeth Hawkins-or possibly Elizabeth Mylwaye born abt 1539 Holland, Ruesel de-Mierden, Noord Brabant Netherlands died 1595 Amsterdam. It all looks suspicious to me! Also, btw I was in Haarlem and Amsterdam last week. Beautiful country! Those seem like classic examples of the mistake. Those migration patterns do not make sense at all. I think you can safely assume that “Holland” was meant. I have been researching my ancestors and I have come to the Holland, Reusel-de Mierden, Noord-Brabant, Netherlands. My 9th great grandfather, Theunis Thomaszen Quick born 1600 Naarden, Noord-Holland, Netherlands. Died 4-19-1666 New Amsterdam,NY. Married Belijtgen Jacobus 3-9-1625. Born 1604 Holland, Reusel-de Mierden, Noord-Brabant, Netherlands. Died 1675 NY was wondering if this might be correct. Auther Craig Quick wrote a geneology on Quick name and some information comes from him. Thanks for your information on this. Its so wonderful having someone that lives there that can give correct info. Thanks for this article! There is so much stuff out there that makes no sense at all, and it always makes me wonder what people are thinking when they add stuff to their trees. (Like children born years after the alleged parents have died, or people who immigrated to the US randomly hopping back on a ship to baptize their babies in England…in the 1600s.) Anyhow, do you suppose that “Hoek van Holland, Zuid-Holland, Netherlands” is another one of these errors? You’re welcome! Why do you think Hoek van Holland is another error? It’s the name of a town in Zuid-Holland. Yes, I realize that, but my train of thought is this: the ancestor that I have who is listed with Hoek van Holland as where he came from in a few trees that I’ve come across (but in no records whatsoever) is in most trees listed with “Holland, Reusel-de Mierden, Noord-Brabant, Netherlands” listed in most of them. I supposed he could be from Hoek van Holland, but absent any actual documents pointing to that, it made me wonder if, since the word Holland is in the name, that was another software guess as to what the person entering in the data at some point was trying to say. Also, sort of unrelated, after reading your article the other day, I realized that another anomaly I’ve been finding in my trees might be a similar sort of mistake, as I have ancestors who lived in Massachusetts in the early 1700s somehow manage to go to “Sep, Swietokrzyskie, Poland” to die, according to some people’s trees. Sep is a tiny hamlet in the middle of nowhere, all on one road, made up of perhaps 20 houses. And when googled, a number of other ancestry links to other people’s trees for completely different people show up. I’m in here, too. Following trees online, I’ve gotten back to my (supposed) 10x gr-grandparents, Frederick Lubbertsen 1606-1679 and Styntje Jans Hendrickse 1607-1654. He’s listed as coming from Reusel-De Mierden; in some trees, she is as well. Others say she was from Amsterdam, New Hampshire. (What?) His parents Lubbert Albertz and Aeltje Jansd, born in Reusel as well, are given birth dates of 1558 and 1563 respectifvely, but both died in 1679, 120-some years later. You’ve got to be kidding me! And Amsterdam, NH ??? No way. Some trees show Styntje marrying in 1657… 3 years after she died. I mistrust all of it now and will go back to check their sources. Incredible! Do you have any good suggestions for me as to where to start? I’ve never gotten into Dutch genealogy before. I’m coming over in the spring and would love to have some of this figured out, correctly. Bernice, reviewing other trees over the years has taught me this…it might be right, it might be wrong, at best a pivot point when against a brickwall, at worst a complete fabrication. It is unfortunate that trees are posted without proper documentation and sources. Our true goal in ancestry research is fact finding. Thus, when we encounter a tree ‘lead’ it is up to us to confirm the facts and document forward. There is tons of information regarding Frederick Lubbertsen. He was married twice, his first wife was Styntje Jans (maybe Hendricks/Hendricksel), his second wife was Tryntje Hendricks/Hendrickse. There is speculation that his wives were sisters. The second marriage occurred in 1657, the first in the 1620s.. The reference to Amsterdam, New Hampshire is likely a reference to Amsterdam Noord-Holland or more recently Amsterdam, North Holland. Even though the providence of Holland was not officially recognized as North and South until the later 1700s. Some 120 years later…Yes, you are astute in recognizing this error. Thus, we seek to establish one date or the other via records and work backwards or forwards from there. We cannot rely on others to do our research. Again, postings on the internet, unfortunately, are often misleading. Thank you for this explanation. I don’t know Dutch – but I know geography. I had this pairing keep coming up and when I looked at maps, it didn’t make sense. my 9th great grandfather willem hoppe is said to be of dutch decent born in reusel-de mirden I know this is wrong as I believe hoppe is german how can I verify? Your article is wonderful! It also dashed my hopes as to the origin of Esther Hess, supposed daughter of John Hess and Anna Sabina Leipersberger. You have to wonder about all the information when you find an error like this one. Esther was born c. 1755, d. 10 July 1829 in Mecklenburg, North Carolina, USA. She was married to John Christopher Goodman. Back to square one on this story. Thanks for letting people know about this error; it needs to be corrected. You’re welcome! Sorry to dash your hopes but at least you won’t spend a lot of time and money tracing down a wrong path. With names like Hess and Leipersberger, in Meckelenburg, I would expect they were from Germany rather than the Netherlands. Or perhaps there were some “Pennsylvania Dutch” ancestors? That is actually “Deutsch” [German for “German”], not “Dutch”, which has confused many people into thinking their family was from the Netherlands. I’ve been looking into family history more since I found out I was pregnant. All of the males on my grandfathers side are listed as being from Noord-Brabant, Netherlands. Started out as Cranen, and ended up changing to Craanen sometime in between 1800-1830. As much as I would love to spend the money to sign up to do more online searching, if the information is incorrect I will definitely think twice! Would love to know more about my family history but I’d rather go “old school” and find my information from a book. So glad I found this! I recommend you go back to the original sources and see what they say. Forget what online trees say, but use original records like church records, town records, and court records. 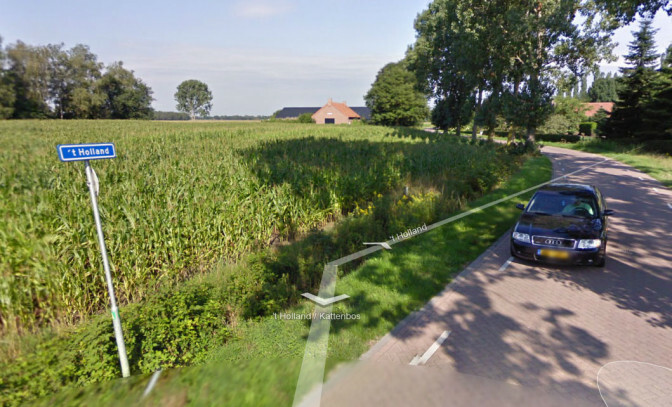 Ahhhhhh, now I’m seeing this place, “Holland, Gutersloh, Nordrhein-Westfalen, Germany” Do you think this could be it? I didn’t know there was a Holland in Germany? I’m excited to hear if you have any info on this! That sounds like it could be a name of a field or hamlet. I haven’t heard about it but in Middle Dutch and Middle German “Holland” means “Hollow land”so there could be many places with that name. There’s a Hodgkinson Family Tree on Ancestry which has John Robinson d. 1625 and his wife Bridget d.1643 in Reusel de Mierden. This looks like an example of the same error; they probably just died somewhere in Holland. Ik ben bezig met mijn vrouws stamboom. DE eamily zegt dat een van haar voorouders, via haar moeder, is kapitein John Underhill. Ik was op zoek naar zijn zuster Petronella Underhill (1593-1642) getrouwd met Ulrich Lupold. Er zijn 82 vermeldingen dat zij was gestorven in Reusel de Mierden. Nooit van deze plaats gehoord. Zocht het op op Google en lande op deze pagina. De vader van Petronella en John Underhill was Sir John Edward Underhill die stierf in Bergen op Zoom. Denk je dat met Holland New Holland (New York) is bedoelt? Ik kan ook niet veel uitvinden van Ulrich Lupold die zougeboren moeten zijn in Nederland. Kan je helpen? Ik denk dat met Holland gewoon Nederland werd bedoeld. New York stond toen als New Netherland bekend. His father was Willem Symonson Van der Wilde, born in Leiden, Netherlands, in 1575. Both had Holland in the birthplace. I surely would like to get this correct . . .
PS: I will be in Amsterdam the middle of April — really looking forward to the visit! Thank you so much for this article, which my neighbor brought to my attention. It makes sense of the discrepancy between possible ancestral locations suggested by the 1953 “Boorse Book” (namely, Friesland or Groningen) and what I found on ancestry.com (namely, the ubiquitous phrase you mention). Apparently “Bohrs” and “Boors” turn up in the northern areas of the Netherlands. I don’t see any reason to trust the ancestry suggestion now that you explain how it could have crept in there. Thank you for the heads up on the errors in our files. I have several Dutch lines out of New Amsterdam in the 1600 including two with the last name Jans. One line is from the Hague and the other unknown. I was watching a PBS special on Vermeer and noted his last name was originally Jans. Is this a common name? Jans is a patronymic meaning “son of Jan.” Jan is the Dutch version of John. So Jans is the Dutch equivalent of the English Johnson. There are many unrelated Jans families in the Netherlands. Unfortunately the only clue I have for Thomas Chaddon was left by his son Lymnan Durvin on a census that said he believed his father was Dutch, and in another place he listed Holland as a possible place of birth. There is also a family story that mentions ancestors as having come over to the original dutch settlement. No solid proof though. Having the most difficult time figuring out where Chaddon came from. I also heard there was a name change because of a family fall out too which doesn’t help much. While it looks like another dead end I appreciate your article letting me know it indeed is a dead end. The name Thomas is rather uncommon in the Netherlands. “Chaddon” is not a Dutch name either. With a name like that, I would think a British Isles origin is more likely. I recommend searching for Thomas and Lymnan in the place where you know they lived, and not only study all the records about them but also of their friends, associates, and neighbors. People often migrated together so maybe that will allow you to pick up the trail. Hello, I been trying to find original birth records of Jan Willemsen Hooghteling. I only find references in family trees which use BIRTH 1615 • Holland, Reusel-de Mierden, Noord-Brabant, Netherlands. There are so many variations of the Hooghteyling. I am trying to find what area her really came from. Hooghteling is not a Dutch name I’m familiar with. It doesn’t appear in the Family Names Database. That could mean that the Dutch version was different, or that the name wasn’t originally Dutch. The names Jan [John] and Willem [William], the name of his father according to his patronymic, are common throughout the Netherlands and in other European countries. If you haven’t already done so, I recommend you do research in original records in the earliest place where you found the family. Those records and the records of their associates are your best chance of finding out more. People often migrated in groups so his associates in the new country may have been associates back home. Hi, just reviewing some files on early New Amsterdam ancestors and was suspicious about the place Holland Reussel de Mierden, North Brabant…. thanks for your helpful explanations. Great to hear the website is useful! As children we’ve always been told about our Dutch heritage. Do not know where in the Netherlands my two grandmother’s came from. Hannah and Marie Van Aca. I want to connect and understand the region. What their lives might of been like before moving to the New Jersey area.Where do I begin my search going back in time. Thank you for your article. I came across it because I was searching my maiden name. My father was Franciscus Antoniius Van de Mierden. He was born in 1927 in Best, N.B. He emigrated to Canada in the early 1950’s with my mother and her family. My mom is Marietje Johanna Van der Loo and was born in Son, N.B. in 1932. I have a cousin that lives in Best. We were told there were no other Van de Mierden’s in the Netherlands. I have found the Van der Mierden name and I think I may have stumbled across some other Van de Mierden names through Google. I’m curious about this place you mention Reusel-de Mierden. I wonder if I would find the Van de Mierden name there. There have been two villages called Hooge Mierde and Lage Mierde since the Middle Ages, together called “De Mierden.” It seems plausible that that’s where your father’s family originally comes from. The only way to know for sure is to trace the male line back in time. They would only have started calling themselves “van de Mierden” after they left Hooge and Lage Mierden. They used names to distinguish themselves, so not after the current place of residence since everybody would have the same name.